Kathy Walkling arrived in Auroville, a self-contained green community on the outskirts of Puducherry, 18 years ago, and found that women who used sanitary napkins would dig a hole and bury them after use. She thought this was unhygienic and bad for the environment. Then, more than a decade ago, she came across a reusable cloth pad. “While I initially felt a little uncomfortable with the idea of washing a blood-soaked pad, I soon discovered that washing took almost no time at all. It was comfortable to wear and I was not adding waste to an already choking planet. I also saved money as that first pad lasted seven years,” says Walkling. Commercial sanitary pads contain super-absorbent polymers (SAP), made mainly from sodium polyacrylate, a petroleum by-product. Combined with plastic, a single sanitary pad takes 500-800 years to decompose. According to a report by market research firm AC Nielsen and the non-profit Plan International, India has around 355 million women and young girls of menstruation age. But owing to economic, social and religious compulsions, only 12% of them use sanitary pads or alternatives. The others use old rags, dry leaves, sand, newspaper or ash, and in some cases nothing at all, exposing themselves to infection. Walkling’s decision to use cloth pads may have been environmental, and as a fallout, resulted in economic gain, but the vision for Eco Femme is steeped in social impact. In 2000, She decided to make and sell reusable pads to the other environmentally conscious women in Auroville. Some women, mostly European, began exporting them to their home countries on a small scale generally to small shops. Over the years, it grew organically into a small business. In 2009, Walkling was working with a grass-roots development NGO called Auroville Village Action Group (Avag), looking to devise livelihood projects for rural women, when she sniffed an export opportunity for cloth pads stitched by rural women. She teamed up with Jessamijn Miedema, a fellow resident at Auroville, to co-found Eco Femme as a social enterprise in 2010. The two invested a total of Rs.3 lakh and collected some donations to test the idea through user research, product prototyping and user testing. By 2012, they had a set-up to start distributing the product domestically and overseas. 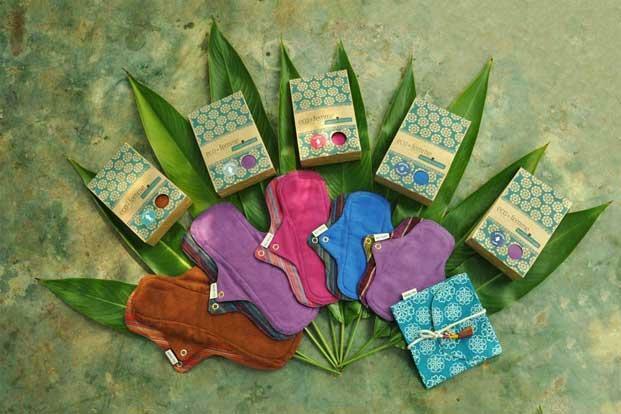 Though Indian women, in rural areas and of earlier generations, have used cloth pads, Eco Femme’s pads differ in their design—with wings and a leak-proof layer, they are more like a modern sanitary napkin in appearance and function. The top layer has absorbent flannel cotton and the absorbent core has six layers of flannel. Cloth pads have been in use in the developed world for decades, and Eco Femme itself has sold over 35,000 pads in 14 countries. In 2013-14, they sold 15,748 Premium pads and 4,000-plus Rural/Subsidized pads. Currently, 45% of their sales are domestic, and 55% international. Two varieties are available—Premium, which costs Rs.235 for a single daily pad and Rs.1,575 for a kit containing seven pads for the full monthly cycle, and Rural, which provides pads of the same quality and material, but differs in its design and pricing structure. Eco Femme says that for every pack it sells internationally, it has a built-inRs.80 donation, which is used to fund an outreach programme in schools and institutions for girls from low-income communities. Eco Femme also creates awareness about menstruation and busts myths surrounding it by educating local women and young schoolgirls on healthy menstrual habits through a programme called Pad for Pad, which is supported by a grant from the UK-based charity Saphara. The girls who attend these programmes are given a pack of four cloth pads and a travel pouch, which they are free to accept or decline. Through the Pad for Pad programme, Eco Femme has reached close to 1,500 adolescent girls and gifted 5,500 pads in Tamil Nadu. In August, the programme got a Rs.30 lakh grant from the United States Agency for International Development (USAID), to help reach 10,000 girls in Tamil Nadu and other states in the next two years. You too can donate to this programme by visiting www.auroville.com/donations and mentioning Eco Femme’s name in the box provided for “project of your choice”/ “specific Auroville projects”. Men in menstruation – are we addressing the elephant in the room?